My bologna has a first name -- it’s F R I E D.
I’ve been a fan of old school country music ever since I was introduced to it in college by Mike Soden, fellow alumni of KU's campus station KJHK 90.7 FM and host of the fondly remembered Jayhawk Hayride. The band that really did it for me was BR5-49, whose self-titled full-length debut had just come out right around then. 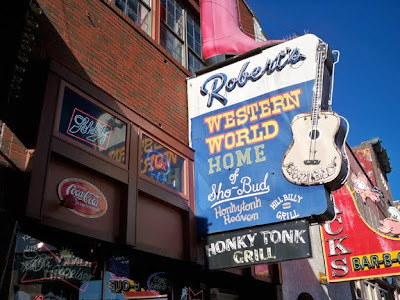 At the time they were recording it, BR5-49 was also playing four-hour sets three times a week as the house band at Robert’s Western World. And as that record remains one of my favorites to this day, I wanted to stop at Robert’s to have a beer and check out BR5-49’s old stomping grounds while I was in Nashville. Like so many of the places on Lower Broadway, Robert’s has live music from open to close, and a handful of people were enjoying afternoon beers and listening to Dave Cox finish up a lunchtime set when we walked in. The two of us took a seat at a high top, and Nicole started eyeing the shelves full of boots lining the nearby wall. Even though a little bit of daylight was coming in through the front window, there’s something about Robert’s that makes it feel like it's always almost last call inside those walls. 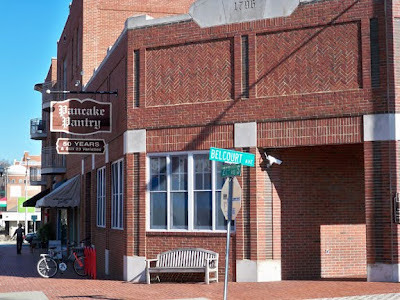 The first place is Pancake Pantry. My co-worker Nicole and I arrived in Nashville mid-morning with some time to spare before we could check into the hotel, so we decided to get some breakfast and found this restaurant on Urbanspoon. They’ve got 23 different kinds of pancakes. 23! Who’s tough stuff now, IHOP?